Known as one of the top travel destinations in the South, it’s no surprise that Chattanooga is home to bustling neighborhoods filled with plenty of eclectic local shopping and dining experiences. Go beyond the usual tourist hotspots, and you’ll find a vibrant city brimming with interesting places to explore. When you’re in town, take the time to visit multiple neighborhoods to see more of what the city has to offer. Here are some of our favorites. 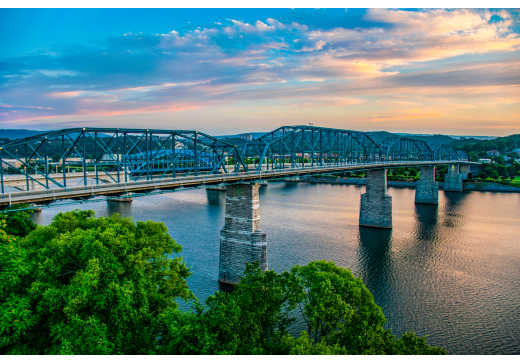 The popular North Shore neighborhood is just north of the Tennessee River and can be accessed via the iconic Walnut Street Bridge. It’s filled with small shops, boutiques, and eateries, which have made it a prime spot for locals and tourists alike. Take a walk across the scenic pedestrian-only bridge before strolling down Frazier Avenue, or pop into Clumpies Ice Cream Co. for a scoop of small-batch ice cream. Make sure you check out Coolidge Park, which features a working antique carousel from 1894 that features 52 hand-carved animals and a calliope band organ. During warm weather, kids will enjoy splashing in the interactive play fountain, and the park features an expansive area for Frisbee or other sports. Stop by Taco Mamacita or Brewhaus to refuel after a day in the park. Just east of North Shore, you’ll find the Riverview neighborhood, also situated right on the Tennessee River. You can enjoy a run or casual bike ride next to the golf course that borders Riverview Park. Be sure to come hungry, as you’ll want to check out some of the local eats. Tremont Tavern offers killer burgers and you can enjoy a cocktail and authentic Italian cuisine at Il Primo. South of downtown, the Southside Historic District is where you’ll find the famous Chattanooga Choo Choo. The former Terminal Station that operated the Southern Railway was saved from demolition when the passenger service ended in the 1970s. It’s now part of a 30-acre complex that includes a hotel, an ice skating rink in the winter, a comedy club, Songbirds, and a nightlife scene that&apos;s steps away on Station Street. It’s a very walkable neighborhood offering lots of eclectic shops and older buildings. Start by exploring Main Street and stopping by Mean Mug or Frothy Monkey for a cup of coffee. Right across the Chattanooga Choo Choo, you’ll find the Chattanooga Whiskey Experimental Distillery, which features a micro-distillery and tasting room. If you’re looking for local eats, Urban Stack is a fun burger joint with excellent outdoor seating. You’ll also find plenty of nightlife options in this neighborhood, including Hi-Fi Clyde&apos;s, and the Flying Squirrel Bar. Downtown features the most well-known tourist destinations, including the Tennessee Aquarium, in addition to plenty of restaurants and bars around every corner. Walk along the river and check out Ross’ Landing and The Passage. Rent a bike and take a ride on the Chattanooga Riverwalk. The Bluff View Art District sits above the river and houses the Hunter Museum of American Art and the Holmberg Bridge along with a fun row of small shops and eateries. Just down the hill from the Bluff, you&apos;ll find The Edwin Hotel, which features Whiskey Thief, a rooftop bar offering incredible views of the Tennessee River. Venture down Market or Broad Street to discover a popular stretch of town that spans several blocks from the Aquarium. Find both classic Southern food and live Southern music at Puckett’s. Grab a drink at Hair of the Dog Pub. Or pick up the microphone yourself at Sing it or Wing it, a karaoke bar and grill. If you’re looking for live entertainment, from Broadway shows to touring musicians, check out the schedule of the Tivoli Theater. Historic St. Elmo is located at the foot of Lookout Mountain and just a few minutes from the heart of downtown. This quaint little area of Chattanooga is home to many buildings that date back to the late 19th and early 20th centuries. Today, you’ll find a wonderful collection of shops, restaurants, and other attractions. Check out 1885 Grill for delicious steaks and coastal seafood. While you’re in the area, take a ride on the Incline Railway. This incline trolley climbs an impressive 72.7 percent grade up Lookout Mountain. As you ride, you’ll be able to take in stunning views of the mountains and valleys in the area. Once you reach the top, you’ll find tons of Civil War history to explore just a few blocks from the station. Visit the Battles for Chattanooga museum, which features a digital projection show that will help you visualize exactly how the Civil War battles were conducted on the mountain. The museum is near the entrance to Point Park, a 10-acre memorial that’s filled with additional Civil War artifacts. If unique dining experiences and family-friendly activities are on your list of things to do, make sure to check out the West Village. Located near MLK & 7th on Chestnut and Pine streets, the newly revitalized area brings a European-style experience to the area. Stroll under the twinkling lights and enjoy a romantic dinner at Old Gilman Grill, Alimentari Cucina e Bar, or Citron et Sel. Shop for apparel, footwear, and accessories at Antibes. And if you need a place to stay, check into the Westin Hotel. If that&apos;s not enough, the West Village comes alive on the weekends, with events like the West Village Market, Out on 8th, and Spring in West Village that are perfect for the family.